The American Flag has very significant colors: "White signifies Purity and Innocence; Red Hardiness and Valor; and Blue Vigilance, Perseverance and Justice." 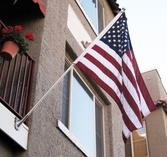 Our Outdoor American Polyextra flags are especially designed and meticulously crafted to please our most discriminating customers with embroidered stars and sewn stripes with heavy duty polyester fabric. Their two-ply polyester fabric is specially loomed and dyed to withstand the most demanding weather conditions, counteract the effects of ultra-violet light, and still remain crisp and bright. Uncommon USA believes in the "highest quality" and "Made In The USA" when it comes to Old Glory. Don't be fooled by inexpensive flags made from inferior materials overseas. 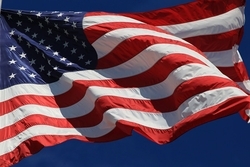 Our United States Flags that we offer to you have a combination of the highest quality components and state-of-the-art manufacturing to give you the best looking and most durable flags in the industry. Our Polyextra Outdoor American Flags come in a wide selection of sizes, but if you can't find what you're looking for or have any questions, please call us at 1-800-470-2210 and we'll be happy to help or place your order over the telephone.